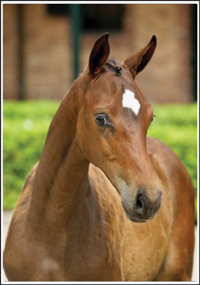 We are a small Dutch Warmblood sport horse breeding operation located on California's Central Coast. We specialize in top bloodlines, with an emphasis on temperament, character, soundness, and performance. DG Bantana Keur, an extraordinary young mare by Flemmingh, was bred in the Netherlands by P. Verdellen. She was the 2006 Dressage Foal Champion at the Central Keuring in Limburg (Netherlands), and placed 5th at the 2006 KWPN National Foal Championship (Netherlands). Bantana was imported in January 2010, and we have great expectations for this beautiful mare. Caitlin Masiel at the National Young Horse Championships and, with an impressive score of 8.34, DG Bantana Keur became the 2010 Markel/USEF National Young Horse 4-Year-Old Reserve Champion. In August 2011, DG Bantana and her rider Caitlin Hamar accepted the prestigious invitation to return to the beautiful Lamplight Equestrian Center and compete in the 5-Year-Old division of the 2011 Markel/USEF National Young Horse Championships. 2012 proved to be another good year for DG Bantana, who successfully finished the show season as 5th place CDS Second Level Horse of the Year. The Free Rein strategy is to slowly develop our breeding stock through the acquisition of exceptionally talented and pedigreed young mares; this provides the opportunity of breeding the mares prior to commencement of their show careers. Our plan is to remain a small business enterprise, enabling us to continue personal interaction with the horses while maintaining the finest performance horse bloodlines to be found.